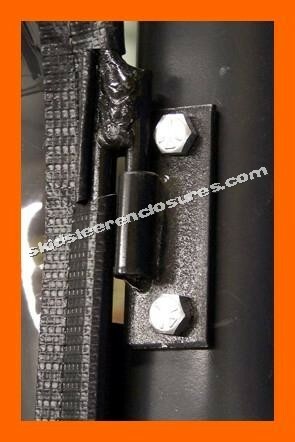 Earlier Model Bobcat Skid Steer Cab Enclosure DOOR. All Weather Safety Door has full size heavy duty vinyl window plus flap at the bottom for cold weather protection. Door is "locked" in place by operator with shock cord and S-hook. The door can be installed and removed in seconds -- 2 steel hinge pins on the door simply drop into hinge brackets (provided) which mount on the skid steer loader frame. Made in the U.S.A.